Is it hard to look over your shoulder? Is there a constant pulling or throbbing pain in your neck? Do you notice a “grinding” sound as you turn your head? Chiropractic care can offer neck pain relief by treating the cause of the pain. 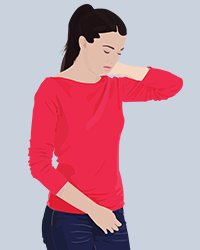 A popular response to neck pain is taking drugs to cover up the problem (aspirin, analgesics, pain pills) or treating its symptoms (muscle relaxers, massage, hot packs), but neck pain isn’t caused by a lack of aspirin or drugs. The chiropractic approach to neck pain is to locate the underlying cause. This begins with a complete case history and thorough examination. Special attention is given to the structure and function of the spine and its affect on the nervous system. With improved structure and function, neck pain often diminishes or totally disappears – without addictive drugs or harmful side effects.